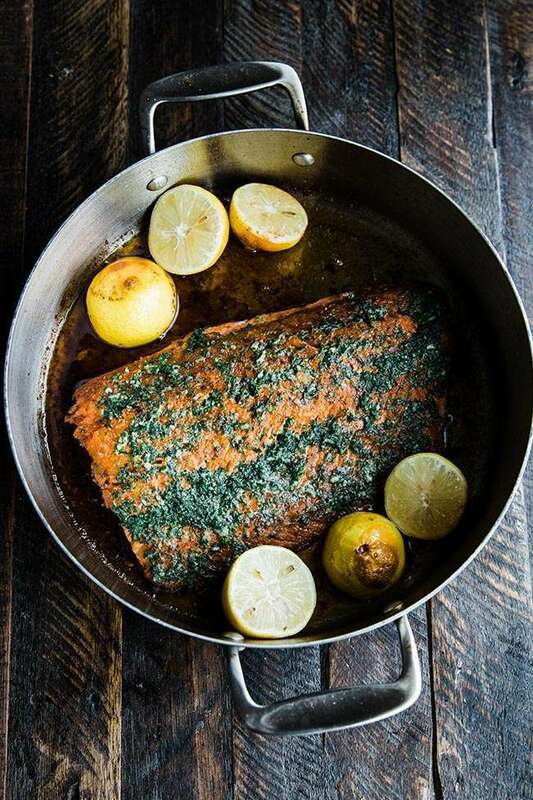 Pan Seared Coho Salmon Recipe with Lemon and herbs: A delicious pan seared coho salmon recipe that is baked with lemon and herbs and serve alongside roasted vegetables. I am all about easy meals when it comes to preparing dinner for the family. While you may be looking at these pictures thinking I spent a ton of time, I actually did not. The pan seared coho salmon literally only took about 15 total minutes to cook while I threw all of the other vegetables into the oven to roast. While I focus much more on the coho salmon recipe and how to cook it in this post, I want you to know that it just goes so well with all vegetables so please feel free to mix and match to your desires, and please don’t forget about seasonality either. Those heavy root veggies and squashes are really coming in so you better believe I am all over those! We are on the tail end of coho salmon season so I’m doing everything in my power to load up on it before it ends in October. If you’ve never had coho salmon, it’s essentially a less fatty, lighter salmon flavored salmon. Coho salmon is also just a touch smaller than King salmon, which is also known as chinook salmon, and can often times be much cheaper. Coho salmon is fished from Alaska all the way down to the Baja in Mexico! Coho salmon, just like any salmon, is super easy to cook because it’s a much more steaky fish in comparison to others. 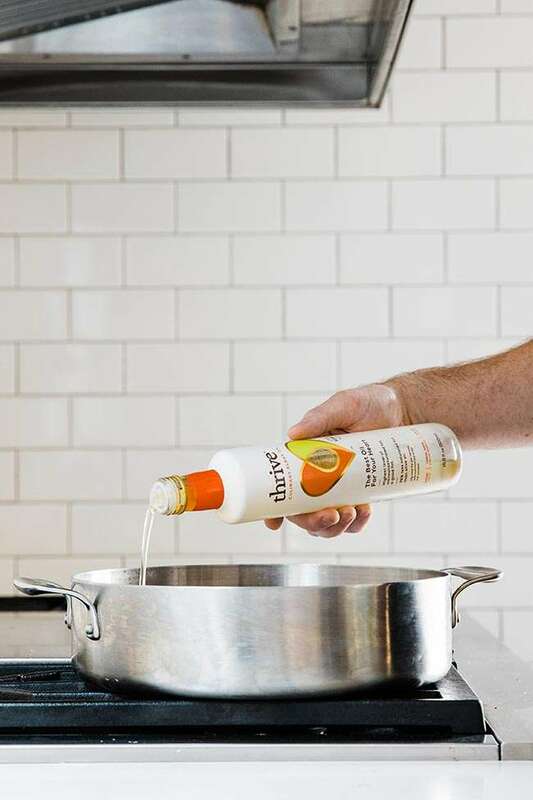 Regardless if you are grilling or pan searing salmon, it all starts with the oil you are using. You can brush the salmon with oil or you can drizzle some in a hot pan before cooking, but either way it’s incredibly important. Because salmon is delicate it cooks very quickly no matter the cooking method, and in addition it browns really well which brings about such good flavor. When pan searing coho salmon I start by adding oil to a hot pan and once it lightly smokes I add in the salmon flesh side down and then turn the heat down to medium. From there I let it cook for 5 to 6 minutes before flipping it over. It’s super important to make sure it pulls away from the pan with ease and does not stick. After you flip the salmon over simply cook it on the cook top or you can finish it in the oven at 375° for 8 to 10 minutes. Lately I’ve been using Thrive Algae Oil for just about everything including cooking and in salad dressing. Thrive Algae oil is ridiculously neutral in flavor and boasts the highest amount of monounsaturated fats and lowest amount of saturated fats compared to other oils. It has a super high smoking point up to 485° making it awesome for oven roasting or pan searing, just like in this coho salmon recipe. I know what you may be thinking, “algae, as in the green stuff at the bottom of a lake?” My answer to you is no. The algae used in this oil grows on land in fermentation tanks, just like those used for making beer and wine, and is packed with Omega 3, 5 and 9. Also not to mention, you can make way more oil from tanks of algae than the acres of land and water needed to produce any other plant based oil out there, making it highly sustainable! I cannot stress enough at just how neutral the flavor in this oil is. I absolutely love cooking with it and it goes wonderfully in a homemade vinaigrette. There is nothing like using a product that you know has tons of benefits and can help significantly during the cooking process. If you want an awesome salmon recipe that is loaded with flavor and tons of delicious nutrients, then this coho salmon is a sure fire winner! Be sure to check out this awesome salmon salad recipe! 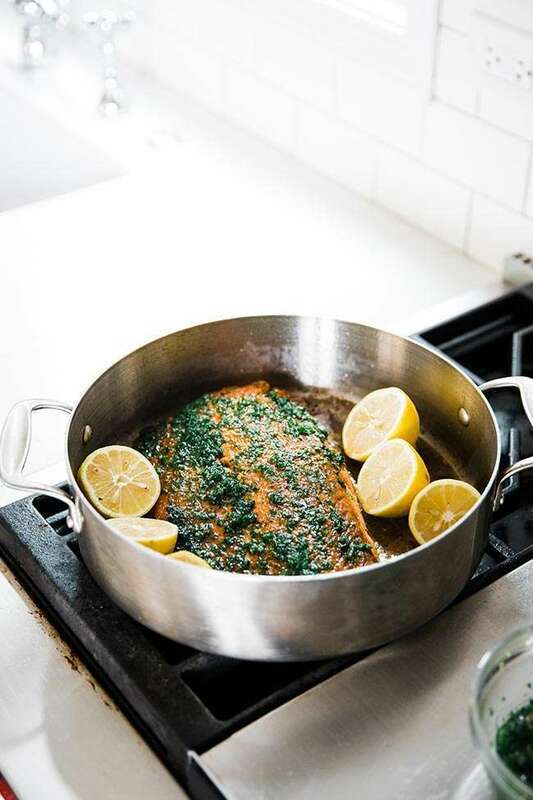 A delicious pan seared coho salmon recipe that is baked with lemon and herbs and serve alongside roasted vegetables. In a small bowl mix together 3 tablespoons of algae oil with dill, chives, parsley, garlic and lemon zest. Set aside. season the salmon very well on both sides with salt and pepper. Be sure to leave the skin on the salmon. Next, add 2 tablespoons of algae oil to a very large saute pan over high heat. 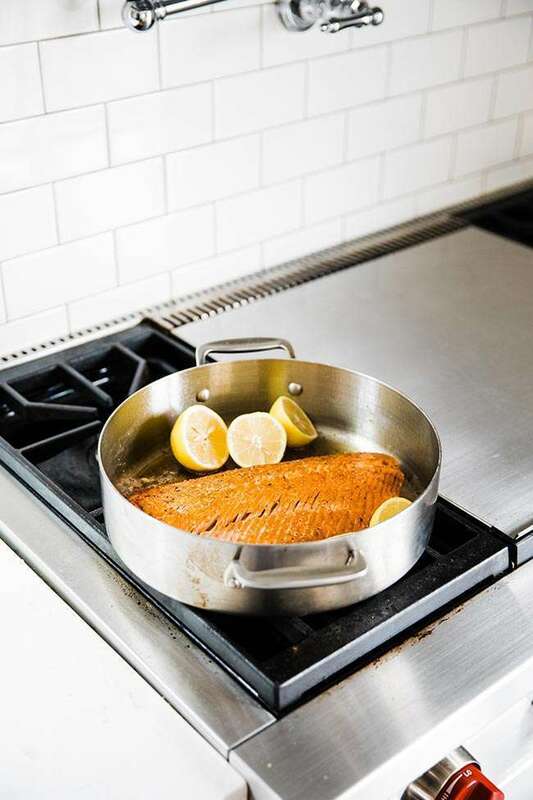 Once the oil begins to lightly smoke, add in the salmon flesh side down into the pan and turn the heat down to medium to medium-high heat. Cook the salmon for 5 to 6 minutes. It should easily pull away from the pan when flipping it. If it stays stuck to the pan, then give it another minute or 2 or until it pulls away with ease. Flip the salmon over and squeeze 1 lemon over the top of the salmon. Note, the pan will smoke. Next, add 2/3 of the herb and oil mixture to the top of the salmon and evenly spread it on. Finish by baking in the oven for 8 to 10 minutes or until it is cooked. Serve the salmon alongside desired assorted roasted vegetables. This is a sponsored conversation written by me on behalf of Thrive Algae Oil. The opinions and text are all mine. I had no idea Thrive has algae oil! Need to try it soon! This salmon looks incredible! I’m not even kidding but it is seriously so amazing and it is all we use nowadays! This really looks like the perfect dinner! I love the fish is seasoned! Oh goodness, this salmon sounds delicious! Your photos are gorgeous, and I am totally drooling. I love salmon, so I need to try this recipe soon! You are too kind, thanks so much for the encouraging words! Oh my gosh that is amazing! I love this so much! WOW this looks so good!! Restaurant quality! I love salmon recipes. Your recipe is looking fantastic ,spice & so delicious. I will definitely make this hope this will be great to eat. Thanks a lot for sharing.